I attended the AMAZE Festival in Berlin in April and a particular game caught my eye there which was called The Berry Garden by Menno Stas. It was a large print on a wall that you could “play” by using a website using your smart phone. This game made me nostalgiac about the paper-based game that I used to play as a child in the back of the car during long journey’s. There would be things like mazes, join the dots and hidden object games, but one of my favourites was decoding secret messages. A part of me was a little disappointed by the fact that this playable print required the addition of technology to play it and I wished that there were more attention given to solely paper-based games. And so, the idea of PaperJam was born! I hosted a game jam over on itch.io which was called PaperJam! A game jam which required participants to devise and produce a game using a single sheet of paper that could be printed off and played. The game jam had over 100 people register for it before games could be submitted, but only 23 people managed to actually submit anything. 75% of people that were interested in the Jam couldn’t find the time to submit (myself included). That seems like quite a high statistic. It would be interesting to see how that compares to other game jams. Still, the turnout was quite good and I also conducted a PaperJam LIVE at Feral Vector, which is an independent games and playful media festival located in Hebden Bridge. I also did a talk there, but I’m hoping to discuss that in a separate post. 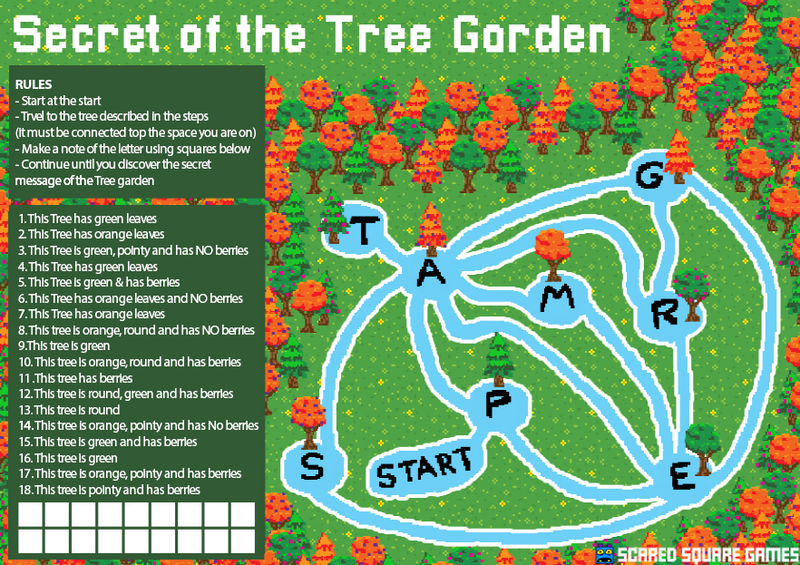 There were some interesting games made during the jam and I prototyped what would become The Secret of the Tree Garden, a playable print/downloadable paper game about uncovering a secret message by travelling between different trees in a garden. I hope to have a go at making more of this type of game in the future, but I really recommend checking out the entries of the PaperJam in the mean time!